The Keystone XL pipeline is, at its core, a deeply destructive concept, and a lightning rod for deception and politicization. Big-monied interests have a huge stake in manipulating the public into thinking that it should be built, and if you listen to conservatives like Mitt Romney, Rush Limbaugh, John Boehner, and even the supposedly “moderate” Scott Brown (who is one of the few Republicans who claim to believe in Global Warming), you would think that the pipeline is the answer to all of our problems; they say it would create jobs (it wouldn’t), decrease price at the pump (it wouldn’t), and decrease our reliance on foreign oil by increasing our domestic supply (it wouldn’t). So where do these lies come from, and what is the truth? This is a 2-part lie. First, the Chamber implies that the oil from the Tar Sands would be for American use. Wrong. In fact, the existing Keystone pipeline currently brings the oil to Midwestern refineries to use in the US, but the whole point of the new pipeline is to BYPASS the interior US refineries, transporting the oil to the Gulf coast where it can be exported to other countries (in Europe and Latin America). 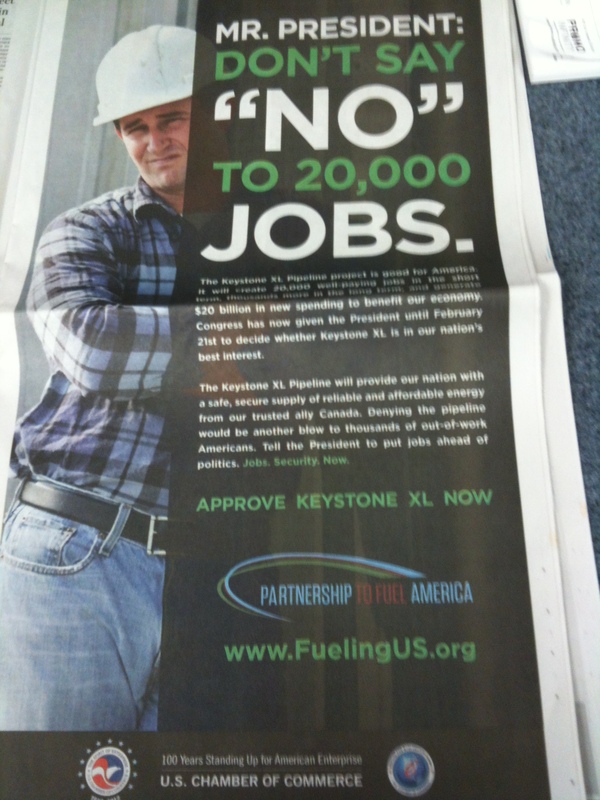 So the Keystone XL pipeline would actually COST America oil. Second, the Chamber claims it would result in ‘affordable energy’ for the US. Wrong. Being that the oil would actually be taken away from the US, gas prices would rise for Americans by roughly 20 cents per gallon. And to suggest otherwise is a lie designed to manipulate the uninformed. 2) As seen by the headline text, the Chamber claimed that it would create 20,000 jobs… this number has long-since been debunked – and by the very person who first created the lie: TransCanada’s Chief Executive Russ Girling. For the Chamber to bring it up as a ‘fact’ is completely disingenuous. But even the 6,500 jobs is misleadingly optimistic. In the only independently-funded study (all others are funded by TransCanada itself), Cornell University’s Global Labor Institute found that it would only create 500-1400 temporary jobs, and then the long-term job effect would actually be negative. But regardless of which random number they choose, it’s probably loosely based on estimate of so-called “spin-off jobs,” or those created as a result of the pipeline being in existence. This analysis was done by Ray Perryman, a Texas-based consultant, and hinges on the pipeline becoming some sort of tourist attraction. His number includes the ludicrous claim that 51 NYC dancers would move to the Midwest to put on shows… apparently for the “100 librarians, 510 bread bakers” and “1,714 bartenders” that the pipeline would supposedly create jobs for. And even if the jobs claim were accurate… some things are more important than jobs and money — like humanity’s ability to inhabit the earth. In fact, few people realize that President Obama approved part of the pipeline – the southern leg that takes oil from Oklahoma to Texas for export. This will likely cause an increase in cost at the pump, so be on the watch for conservatives to blame Obama for approving the pipeline that they are currently blaming for not approving. The Keystone pipeline is still in existence and growing. It poses a serious threat to humanity’s ability to inhabit planet Earth. It’s time for change.